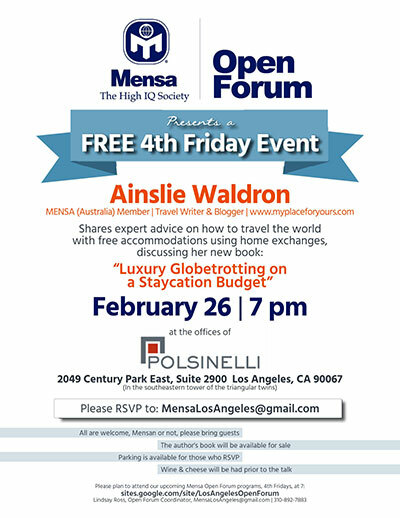 MENSA (Australia) Member, Travel Writter & Blogger Ainslie Waldron shares expert advice on how to travel the world with free accommodations using home exchanges, discussing her new book: "Luxury Globetrotting on a Staycation Budget". All are welcome, Mensan or not, please bring guests. The author's book will be available for sale. Parking is available for those who RSVP. Wine & cheese will be had prior to the talk. Contact: Lindsay Ross, Open Forum Coordinator, [hidden email], 310-892-7883.